By now, you may have heard the words "Jolly Bar" tossed around our blog and website, but you may be unfamiliar with exactly what a Jolly Bar is! Exclusive to Fat Quarter Shop, Jolly Bars are collections of 5" x 10" cuts of fabric. The projects for these little bars are unlimited! 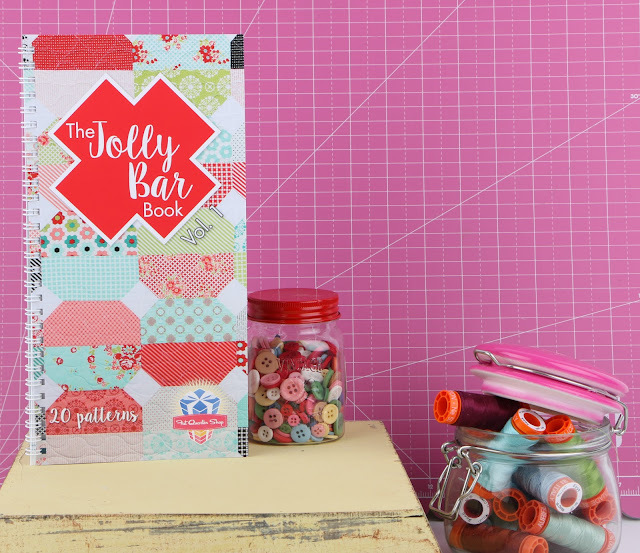 Luckily for you, we've packed a whole bunch of fun projects into The Jolly Bar Book! Dying to find out what projects the Jolly Bar precuts inspire? Take a look inside the cover! Get your hands on The Jolly Bar Book today, and find all of the fabric, thread, and accessories that you may need all in one place! If you've been working with Jolly Bars and the Jolly Bar Book, let us know! We love seeing your projects! Share your photos on social media with the hashtag #jollybar.